Ellis Dau has spent his childhood dreaming of London, New York and Ashford in Kent, from his home in Kyrzbekistan. When he’s expelled from school, his father takes him to work with him at the Chronicle, the last remnant of free speech in the highly repressive country. As Ellis starts to fall in love, with the local oligarch’s daughter, he grows to learn that some things are worth fighting for. It’s a relief to see that Wroe’s ability to reveal the eccentricities in his characters has not lessened in his second book. Ellis starts off the novel as a very mixed up sixteen year old, and I recognised his melodramatic tendencies from my own teenage years, as Ellis thinks of his grounding as being a prisoner, telling his mother ‘this is a gross injustice’. His father Cornelius possesses some unique traits such as standing on his head every morning for ten minutes, and is a mystery for Ellis. I like the fact that Wroe includes this detail, as many teenagers have no idea why their parents behave the way that they do, and it’s endearing that Ellis ‘would put on his father’s spare town shoes and walk about’ in a attempt to understand his father, as well as absorbing ‘the serious adult power he imagined lay within’. It’s only when Cornelius takes Ellis to work with him, that Ellis sees something more to his father than the very taciturn and quiet man that Cornelius is at home. Wroe’s way of describing the difference is memorable as well ‘the dry riverbed of conversation became a raging torrent’. Wroe divides the book into three sections, First Glimpses, Cuts and These words are forbidden. First Glimpses ends with Ellis realising that his father can’t solve everything, and that he had only ever been ‘the small, the neutral’. Cuts is about Ellis becoming stronger, and learning to care about freedom of speech for his fellow countrymen, however I think it’s the arrest of his mother that truly tips him over into action. 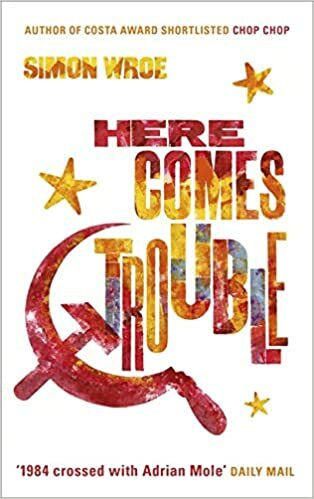 Wroe’s ability to paint graphic pictures for the reader comes out again, and inevitably there are violent sections of the novel, given that there are a group calling themselves the Horsemen who seek to oppress wide swathes of the Kyrzbekistan people. Each of the characters Wroe creates within the novel are flawed, but those that Ellis is interacting with regularly, seem to have a shared tendency to stand up against oppression regardless of the personal consequences. Joan, Ellis’s love interest is brave from the outset reacting with ‘deep reverential boredom’ to Grotz, the leader of the Horsemen. Cornelius tells Grotz that they are ‘thugs’ even after the Chronicle has been trashed. However dark the events of the book get, Wroe has created patches of lightness as well. He creates situations for Ellis to get into, such as trying to get into a nightclub, and making up his own game of ‘body bowling’, which are very funny. This book confirms my opinion of Wroe as a incredibly gifted writer with a keen eye for the quirks and silliness that can exist in human nature. I will be keeping a look out for whatever he does next.